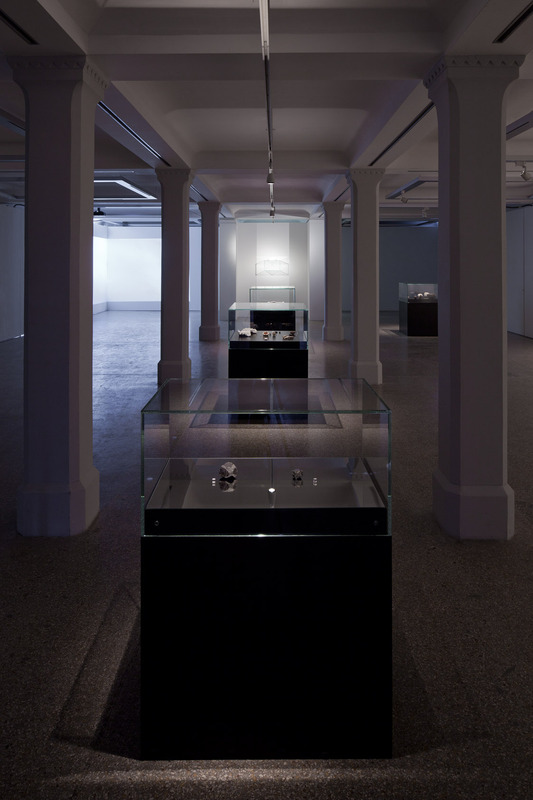 Installation view of STEINE featuring stones of a biological and geological nature with amulet and films beyond. In the foreground are two meteorites – Allende and Murchison on loan from the Museum für Naturkunde, Berlin for the duration of the exhibition. Allende meteorite, weighs 276 grams. Pueblito de Allende, Chihuauha, Mexico, 1.05 a.m, 8 February, 1969. The Allende meteorite is about the oldest object in the Solar System and is made up of material which has remained unaltered since the time before our Sun and planets formed. Its mineral grains have been dated to 4566 million (plus or minus one or two million) years old, pre-dating the formation of the Earth itself. Murchison meteorite, weighs 118 grams. Near the town of Murchison, Victoria, Australia, 10.58 a.m, 28 September, 1969. Every year, around 40,000 tons of material from outer space falls to Earth: often as tiny specks of dust. Meteorites are very rare. This meteorite is unusual as it contains about 14,000 organic compounds including 70 amino acids – a discovery supporting the view that early life may have been brought to Earth by meteorites similar to Murchison. You are currently reading ALLENDE METEORITE at geologicnotes.